Epperson Brothers Kenpo Karate is a Martial Arts School offering Karate, Kempo/Kenpo, Chuck Epperson - 8th Degree Associate Master Of The Arts in Ed Parker’s American Kenpo under GM Richard Huk Planas : http:, www.parkerplanaslineage.com & Chuck Epperson – 3rd Grade CDP Black belt in Eskrima classes in Chico, CA for kids, men and women. 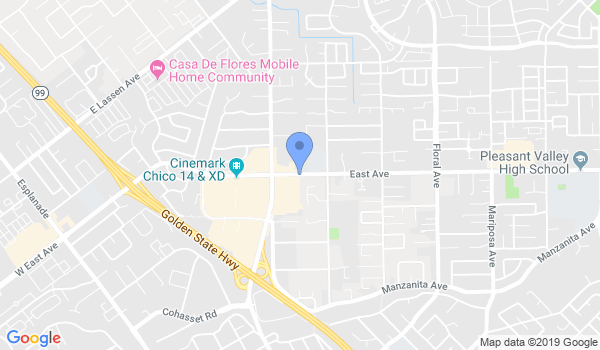 Epperson Brothers Kenpo Karate is Located at 1215 Mangrove Ave.
View a Location Map, get Directions, Contact Epperson Brothers Kenpo Karate or view program details below. If you are a student at this school, help your local Martial Arts Community by writing a Review of Epperson Brothers Kenpo Karate. You can also help your school by sharing it on Facebook, Twitter, Google+, Pinterest etc. http://eppersonbroskenpo.com/ We have developed a unique style programmed by experts in the fields of physical education, elementary education and Martial Arts. Lessons are organized according to developmental needs of the specific age group. Chuck & Nanette believe the combination of physical education goals and the teaching of marital arts create a positive forum that focuses on the development of the whole child (social, emotional, physical) in a meaningful context. Would you like more information on hours, classes and programs available at Epperson Brothers Kenpo Karate? Please contact the school with your questions. Update the details, Write a Review or Report Error of Epperson Brothers Kenpo Karate. View all Dojo in Chico or in Zip code 95926.